Direct connectivity is only available with an Enterprise subscription. A direct connection is one that you broker yourself, without endpoints having to ‘phone home’ to RealVNC’s cloud service. You must know the IP address or hostname of the remote computer at the moment you want to connect, and you will likely need to reconfigure intermediate firewalls and routers in advance too. See the set up instructions below for a private network such as a LAN or VPN, or a public network such as the Internet. 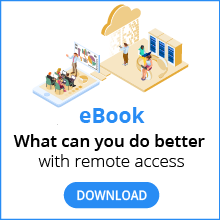 To any remote computer with an Enterprise subscription, you can establish a direct connection, a cloud connection, or both. Read our guide to cloud versus direct for more information. On the remote computer you want to control, make sure direct connectivity is enabled. You may also need to qualify the address with a port number if VNC Server is listening on a port other than the default 5900, for example 192.168.5.236:80 for port 5980 or 192.168.5.236::80 for port 80. If you sign in to VNC Server at install-time using your RealVNC account credentials, simply follow the in-app instructions. If you enter a license key (either desk-side or remotely), direct connectivity is automatically enabled. Download VNC Server to the computer you want to control and choose an Enterprise subscription. Use VNC Server to look up the private (internal) IP address of the computer. Download VNC Viewer to the device you want to control from. Enter the private IP address in VNC Viewer to establish a direct connection. Enter the user name and password you typically use to log on to the VNC Server computer. Configure the VNC Server computer’s firewall to add an exception for VNC. Configure the VNC Server computer’s router to forward port 5900. Look up the VNC Server computer’s public (external) IP address. Enter the public IP address in VNC Viewer to establish a direct connection.